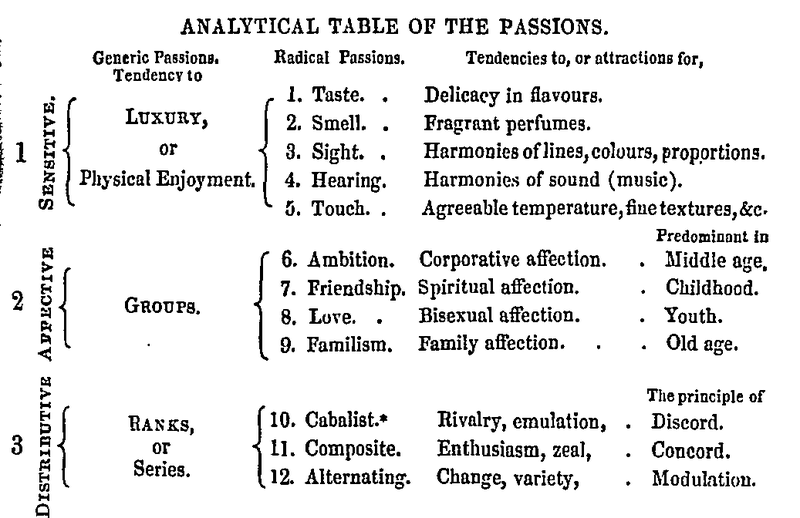 Excerpts from various works by Charles Fourier (1772-1837) which set out his main ideas: the combined order of the passionate series, the 12 passions, gluttony, attractive labor, education, criticism of free will and civilization. Despite several mistakes, such as the maintenance of the wage system (and hence class society, commodity and state), and the illusion about the possibility of an alternative economy parallel to capitalism, and also a certain teleological naturalist fantasy, the fundamental ideas of Charles Fourier remain extremely insightful and impressive. Note by humanaesfera: Excerpts from various works [*] by Charles Fourier (1772-1837) which set out his main ideas: the combined order of the passionate series, the 12 passions, gluttony, attractive labor, education, criticism of free will and civilization. 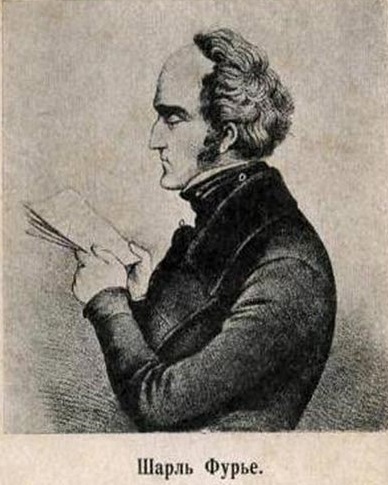 Despite several mistakes, such as the maintenance of the wage system (and hence class society, commodity and state), and the illusion about the possibility of an alternative economy parallel to capitalism, and also a certain teleological naturalist fantasy, the fundamental ideas of Charles Fourier remain extremely insightful and impressive. Q.M. - Théorie des quatre mouvements et des destinées générales (1808). U.U. - Théorie de l'unité universelle (1822-1823). N.M. - Le Nouveau monde industriel et sociétaire ou invention du procédé d'industrie attrayante et naturelle, distribuée en séries passionnées (1829). F.I. - La fausse industrie morcelée répugnante et mensongère et l'antidote, l'industrie naturelle, combinée, attrayante, véridique donnant quadruple produit (1835). All these works can be found online at http://gallica.bnf.fr , of the National Library of France. Some excerpts have been translated by humanaesfera from French, but most have been taken, with some improvements, from Charles Fourier Archive at marxists.org. “The servitude of the Civilized [...] is so easily ascertained that it would be superfluous to demonstrate it; but he remains proud in a trench in which he still resists, and because of the lack of political and material freedoms he clings to some spiritual freedoms, especially Free Will [...]. If there is a question to which Bacon's precept, "to remake human understanding and forget all that has been learned",should apply is that of Free Will. It takes all the insolence of our sophists to claim that man is free to choose between good and evil when they persuade him that if he opts for what they call evil, he will be tortured in this world by executioners or philosophical killers; and in the other world by demons or theological murderers. Even an animal, though devoid of reason, would not dare opt for the supposed evil in such a situation. Put a starving dog near the food and his first thought will be to commit evil, steal and devour the coveted object; but make him see the scourge hanging over his head and the poor animal will cringe and seem to tell you: if I were free, I would eat the food, but as you will beat me, I rather die of hunger. “The learned world is wholly imbued with a doctrine termed MORALITY, which is a mortal enemy of passional attraction. Morality teaches man to be at war with himself, to resist his passions, to repress them, to believe that God was incapable of organising our souls, our passions wisely; that he needed the teachings of Plato and Seneca in order to know how to distribute characteristics and instincts. Imbued with these prejudices regarding the impotence of God, the learned world was not qualified to estimate the natural impulses or passional attractions, which morality proscribes and relegates to the rank of vices. “An objection [to the idea of a societal mechanism] seemingly more reasonable, and which needs to be refuted more than once, is that of social discords. How conciliate the passions, the conflicting interests, the incompatible characters, — in short, the innumerable disparities which engender so much discord ? “The four affective passions tending to form the four groups of friendship, love, ambition, paternity or consanguinity are familiar enough ; but no analyses, or parallels, or scales have been made of them. “10ª - The CABALIST is the passion that, like love, has the property of confounding ranks, drawing superiors and inferiors closer to each other. Everyone must recall occasions when he has been strongly drawn into some path followed with complete success. For instance : electoral cabal to elect a certain candidate ; cabal on 'Change in the stock-jobbing game ; cabal of two pairs of lovers, planning a quartet without the father's knowledge ; a family cabal to secure a desirable match. If these intrigues are crowned with success, the participants become friends ; in spite of some anxiety, they have passed happy moments together while conducting the intrigue ; the emotions it arouses are necessities of the soul. Far removed from the insipid calm whose charms are extolled by morality, the cabalistic spirit is the true destination of man. Plotting doubles his resources, enlarges his faculties. Compare the tone of a formal social gathering, its moral, stilted, languishing jargon, with the tone of these same people united in a cabal : they will appear transformed to you; you will admire their terseness, their animation, the quick play of ideas, the alertness of action, of decision ; in a word, the rapidity of the spiritual or material motion. This fine development of the human faculties is the fruit of the cabalist or tenth passion, which constantly prevails in the labours and the reunions of a passionate series. "The general perfection of industry will spring, then, from the passion which is most condemned by the philosophers; the cabalist or dissident, which has never been able to obtain among us the rank of a passion, notwithstanding that it is so strongly rooted even in the philosophers themselves, who are the greatest intriguers in the social world. 12th. THE COMPOSITE. – This passion requires in every action a composite allurement or pleasure of the senses and of the soul, and consequently the blind enthusiasm which is born only of the mingling of the two kinds of pleasure. These conditions are but little compatible with civilized labor, which, far from offering any allurement either to the senses or the soul, is only a double torment even in the most vaunted of work-shops, such as the spinning factories of England where the people, even the children, work fifteen hours a day, under the lash, in premises devoid of air. The composite is the most beautiful of the twelve passions, the one which enhances the value of all the others. A love is not beautiful unless it is a composite love, combining the charm of the senses and of the soul. It becomes trifling or deception if it limits itself to one of these springs. An ambition is not vehement unless it brings into play the two springs, glory and interest. It is then that it becomes capable of brilliant efforts. The composite commands so great a respect, that all are agreed in despising people inclined to simple pleasure. Let a man provide himself with fine viands, fine wines, with the intention of enjoying them alone, of giving himself up to gormandizing by himself, and he exposes himself to well-merited gibes. But if this man gathers a select company in his house, where one may enjoy at the same time the pleasure of the senses by good cheer, and the pleasure of the soul by companionship, he will be lauded, because these banquets will be a composite and not a simple pleasure. 11th. THE PAPILLONNE [Butterfly] or Alternating. Although eleventh according to rank, it should be examined after the twelfth, because it serves as a link between the other two, the tenth and the twelfth. If the sessions of the series were meant to be prolonged twelve or fifteen hours like those of civilized workmen, who, from morning till night, stupefy themselves by being engaged in insipid duties without any diversion, God would have given us a taste for monotony, an abhorrence of variety. But as the sessions of the series are to be very short, and the enthusiasm inspired by the composite is incapable of being prolonged beyond an hour and a half, God, in conformity to this industrial order, had to endow us with the passion of papillonnage, the craving for periodic variety in the phases of life, and for frequent variety in our occupations. Instead of working twelve hours with a scant intermission for a poor, dull dinner, the associative state will never extend its sessions of labor beyond an hour and a half or at most two; besides, it will diffuse a host of pleasures, reunions of the two sexes terminating in a repast, from which one will proceed to new diversions, with different company and cabals. Without this hypothesis of associative labor, arranged in the order I have described, it would be impossible to conceive for what purpose God should have given us three passions so antagonistic to the monotony experienced in civilization, and so unreasonable that, in the existing state, they have not even been accorded the rank of passions, but are termed only vices. "The seven “affective” and “distributive” passions depend more upon the spirit than upon matter; they rank as PRIMITIVES. Their combined action engenders a collective passion or one formed by the union of the other seven, as white is formed by the union of the seven colors of a ray of light; I shall call this thirteenth passion Harmonism or Unityism; it is even less known than the tenth, eleventh, and twelfth, of which I have not spoken. "I shall, in order to dispose others to share my confidence, explain the object of one of these impulses, accounted as vicious. I select a propensity which is the most general and the most thwarted by education: it is the gluttony of children, their fondness for dainties, in opposition to the advice of the pedagogues who counsel them to like bread, to eat more bread than their allowance. "In the civilized state, love of eating does not ally itself to industry because the producer worker does not enjoy the goods which he has cultivated or manufactured. This passion therefore becomes an attribute of the idle; and through that alone it would be vicious, were it not so already by the outlay and the excesses which it occasions. In the associative state love of eating plays an entirely opposite role; it is no longer a reward of idleness but of industry; because there the poorest tiller of the soil participates in the consumption of choice commodities. Moreover, its only influence will be to preserve us from excess, by dint of variety, and to stimulate us to work by allying the intrigues of consumption to those of production, preparation, and distribution. Production being the most important of the four, let us first state the principle which must guide it; it is the generalization of epicurism. In point of fact. If the whole human race could be raised to a high degree of gastronomic refinement, even in regard to the most ordinary kinds of food, such as cabbages and radishes, and everyone be given a competence which would allow him to refuse all edibles which are mediocre in quality or treatment, the result would be that every cultivated country would, after a few years, be covered with delicious productions; for there would be no sale for mediocre ones, such as bitter melons, bitter peaches, which certain kinds of soil yield, upon which neither melons nor peaches would be cultivated; every district would confine itself to productions which its soil is capable of raising to perfection; it would fetch earth for spots where the soil is poor, or perhaps convert them into forests, artificial meadows, or whatever else might yield products of good quality. It is not that the passionate Series do not consume ordinary eatables and stuffs; but they desire, even in ordinary things such as beans and coarse cloth, the most perfect quality possible, in conformity to the proportions which Nature has established in industrial attraction. "It will be observed that in Harmony the only paternal function of the father is to yield to his natural impulse, to spoil the child, to humor all his whims. The finicky child will be sufficiently reproved and mocked by his peers. When an infant or little child has in the course of the day passed through half a dozen such groups and undergone their jokes, he is thoroughly imbued with a sense of his insufficiency, and quite disposed to listen to the advice of the patriarchs and venerables who are good enough to offer him instruction. "Nature endows every child with a great number of instincts in industry, about thirty, of which some are primary or guiding and lead to those that are secondary. The point is to discover first of all the primary instincts: the child will seize this bait as soon as it is presented to him; accordingly, as soon as he is able to walk, to leave the infant seristery, the male and female nurses in whose charge he is placed hasten to conduct him to all the workshops and fill the industrial reunions which are close by; and as he finds every where diminutive tools, an industry in miniature, in which little tots of from two and a half to three years already engage, with whom he is anxious to associate, to rummage about, to handle things, at the end of a fortnight one may discern what are the workshops that attract him, what his industrial instincts. The phalanx containing an exceedingly great variety of occupations, it is impossible that the child in passing from one to the other should not find opportunities of satisfying several of his dominant instincts; these will exhibit themselves at the sight of the little tools manipulated by other children a few months older than himself. There are many others; I limit myself to naming these five first, which are very familiar to the civilized. Let us examine the method to be followed in order to apply them to industry at an early age. The male and female nurses will first exploit the mania for rummaging so dominant in a child of two. He wants to peer into every place, to handle and examine everything he sees. He is consequently obliged to be kept apart, in a bare room, otherwise he would destroy everything. This propensity to handle everything is a bait to industry; to draw him to it, he will be conducted to the little workshops; there he will see children only two and a half and three years old using little tools, little hammers. He will wish to exercise his imitative mania, termed APING; he will be given some tools, but he will want to be admitted among the children of twenty-six and twenty-seven months who know how to work, and who will repel him. He will persist if the work coincides with any of his instincts: the nurse or the patriarch will teach him some portion of the work, and he will very soon succeed in making himself useful in some trifling things which will serve him as an introduction; let us examine this effect in regard to an inconsiderable kind of labor, within the reach of the smallest children, the shelling and sorting of green peas. This work which with us would occupy the hands of people of thirty, will be consigned to children of two, three, four years of age: the hall is provided with inclined tables containing a number of hollows; two little ones are seated at the raised side; they take the peas out of the shell, the inclination of the table causes the grains to roll towards the lower side where three tots are placed of twenty-five, thirty, thirty-five months, charged with the task of sorting, and furnished with special implements. The thing to be done is to separate the smallest peas for the sweetened ragout, the medium ones for the bacon ragout, and the largest for the soup. The child of thirty-five months first selects the little ones which are the most difficult to pick out; she sends all the large and medium ones to the next hollow, where the child of thirty months shoves those that seem large to the third hollow, returns the little ones to the first, and drops the medium grains into the basket. The infant of twenty-five months, placed at the third hollow, has an easy task; he returns some medium grains to the second, and gathers the large ones into his basket. "No attempt will be made, as is the case in existing educational methods, to create precocious little savants, intellectual primary school beginners, initiated from their sixth year in scientific subtleties; the endeavor will by preference be to secure mechanical precocity; capability in bodily industry, which, far from retarding the growth of the mind, accelerates it. If one wishes to observe the general inclination of children of from four and a half to nine years of age, he will see that they are strongly drawn to all material exercises, and very little to studies; it is right then, that, in accordance with the desire of nature or attraction, the cultivation of the material should predominate at that age.